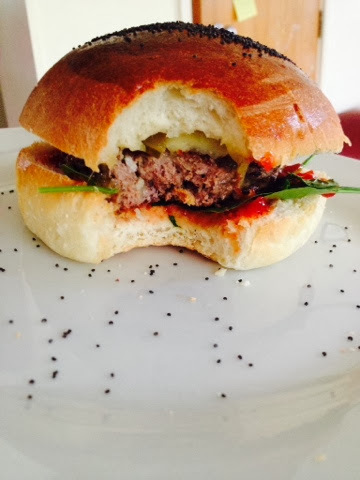 Make-do Mum: Hamburgers from scratch. I'm starting to get better so cooking a lot more. Having a lot of thinking time allows for elaborate meal planning. I'm slowly starting to incorporate stuff from the garden, but, apart from herbs and spring onions there isn't much ready yet. The other day I decided to make hamburgers from scratch. I figured it would be a project that would easily last the day. I was super pleased with the result. The hamburger buns were beautiful. I proved them under the heat pump and they rose superbly. I made two little ones for younger eaters. I found the lid of my Easiyo yoghurt maker the perfect mould for the hamburger patties, and a jam jar lid was great for small kiddy patties. The mince patties included sage, spring onion and parsley from the garden. We had potato wedges sprinkled with stock powder to accompany. The girls liked the meal a lot, although my youngest objected to the poppy seeds on the top of the buns - she was worried they would grow in her tummy!